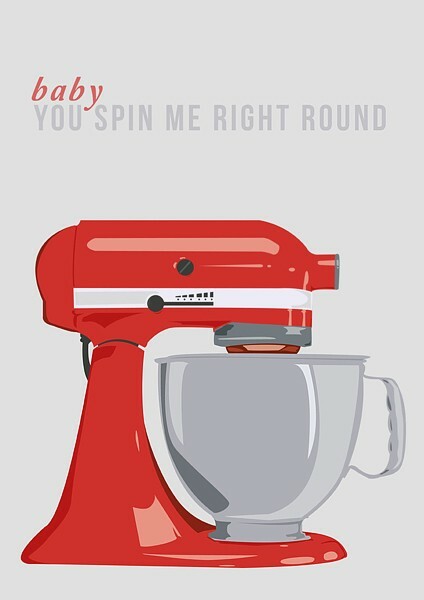 Anne Strawberry: Wednesday Want- KitchenAid Art?! The real empire red is even on sale on Amazon this week- coming in under $200 after rebate for the amazing 5 quart Artisan Mixer. That's cheaper than Craigslist around here (though people seem a little crazy on CL Phoenix, $300 for a crazy particle board dresser? My hunt for a French Provincial dresser is futile and slightly frustrating when I see so many bloggers finding gems for next to nothing!) Ahem. There's a huge selection of colors and no better Christmas/Birthday/Whatever present. Check out the 'Yellow Pepper' and 'Green Apple'. Ah, I love that poster! Love it! It's even the right color!